If you're looking for a casual yet chic look, wear a white ruffle long sleeve blouse and Style Stalker stylestalker goldfinger sequin pants. Both pieces are totally comfy and will look fabulous together. When it comes to footwear, this outfit is round off nicely with red suede pumps. 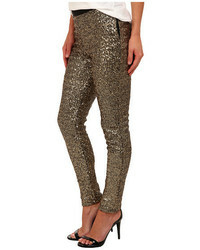 If you're in search of a casual yet chic ensemble, consider pairing a navy christmas crew-neck sweater with Style Stalker stylestalker goldfinger sequin pants from 6pm.com. Both items are totally comfy and will look fabulous paired together. Bump up the cool of your ensemble by complementing it with red leather pumps. 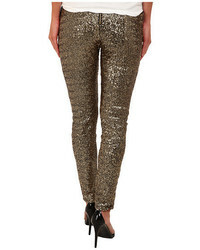 If you're looking for a casual yet totally chic look, consider pairing a red peplum top with gold sequin skinny pants. Both items are totally comfy and will look fabulous paired together. Round off this outfit with black embellished leather heeled sandals. If you're searching for a casual yet chic look, pair a grey long sleeve t-shirt with Style Stalker stylestalker goldfinger sequin pants. Both pieces are totally comfy and will look fabulous together. Finish off with grey suede pumps and off you go looking gorgeous. 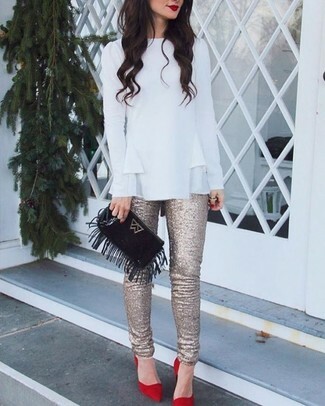 If you're on the hunt for a casual yet absolutely chic look, rock a white blazer with Style Stalker stylestalker goldfinger sequin pants from 6pm.com. Both items are totally comfy and will look fabulous together. A pair of black suede pumps will seamlessly integrate within a variety of getups. 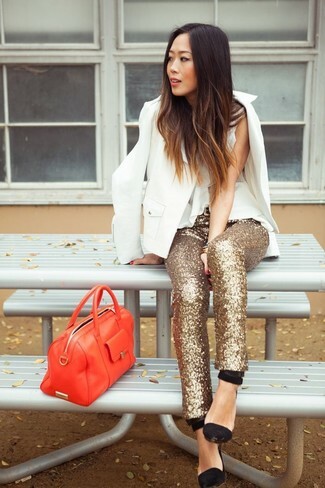 If you're on the lookout for a casual yet stylish look, wear a black blazer with gold sequin skinny pants. Both pieces are totally comfy and will look fabulous paired together. Black suede pumps are a savvy choice to finish off the look. If you're searching for a casual yet chic ensemble, wear a charcoal fur vest with Style Stalker stylestalker goldfinger sequin pants from 6pm.com. Both pieces are totally comfy and will look fabulous together. And if you want to instantly up the style of your look with one piece, add black suede pumps to the mix.